Numbers, letters, and colors is just the beginning of what Alphie the learning robot teaches. 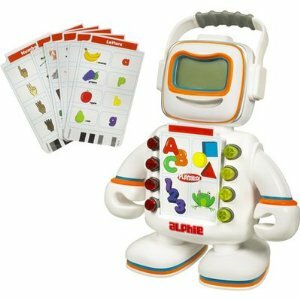 From letter sounds and shape sorting to patterns, cause and effect, vocabulary development and much more, the Alphie robot teaches important facts and skills. As his buttons light up and he sings and plays music, he facilitates fun quizzes, games, and learning activities. Learning is fun with this robot. Store the activity cards in his backpack. Insert any learning activity card in him and he begins to teach.